Camp 1 : 17,18th,19th April . 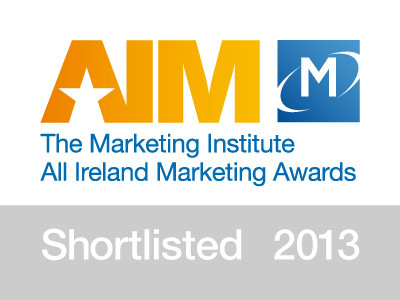 Camp 2 :22nd, 23rd, 24th April. 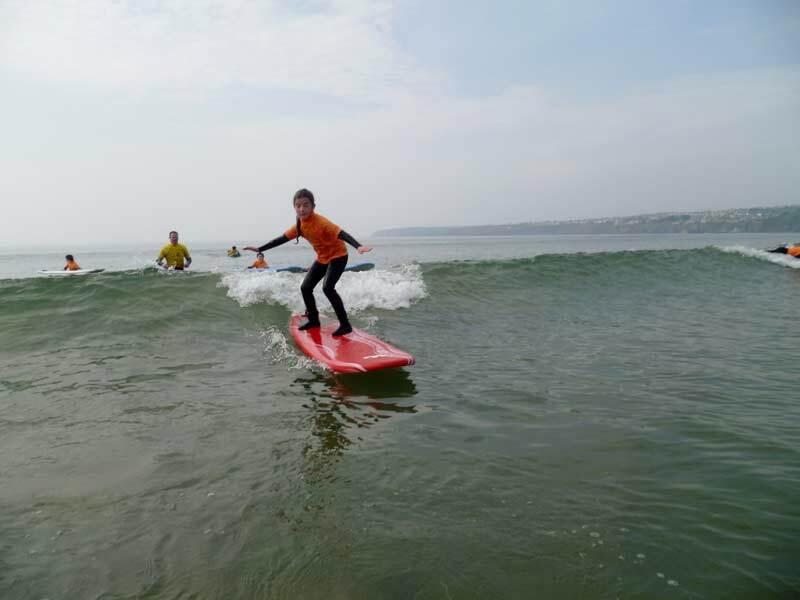 All ages and ability levels are catered to on our Summer Surf Camps. 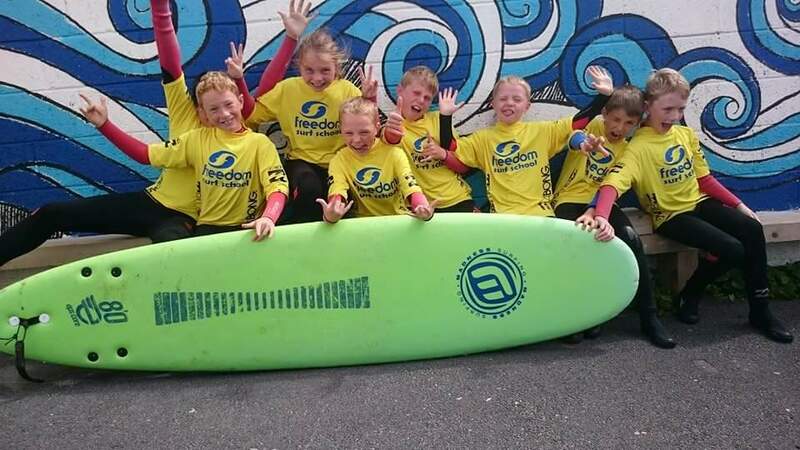 Apart from learning HOW TO SURF - have best fun ever and making new friends, you will also learn about beach &water safety, types of waves and tidal conditions.Choosing the right surf board and wet suit to suit you. Ages 6 – 8 years. 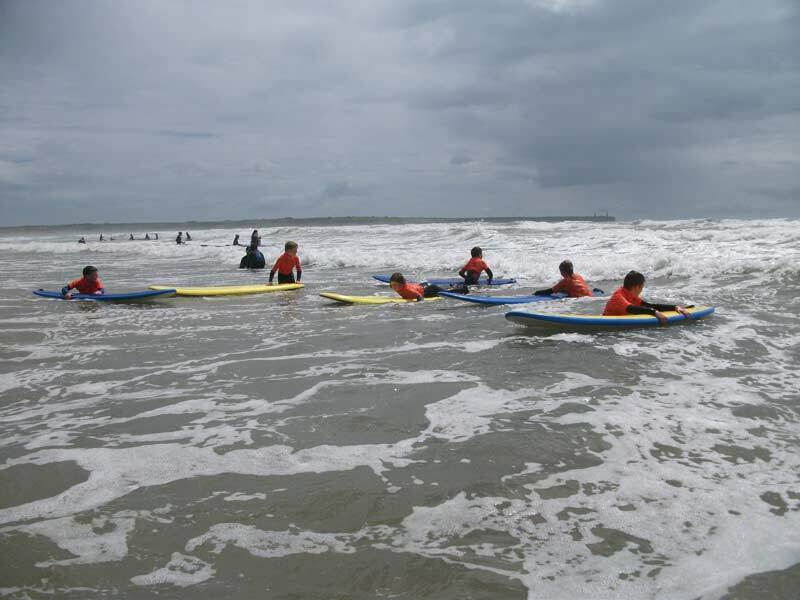 Consists of Bodyboarding & Surfing experience, fun beach games and rock pool exploration. Focus is on introducing kids to the Beach Environment. 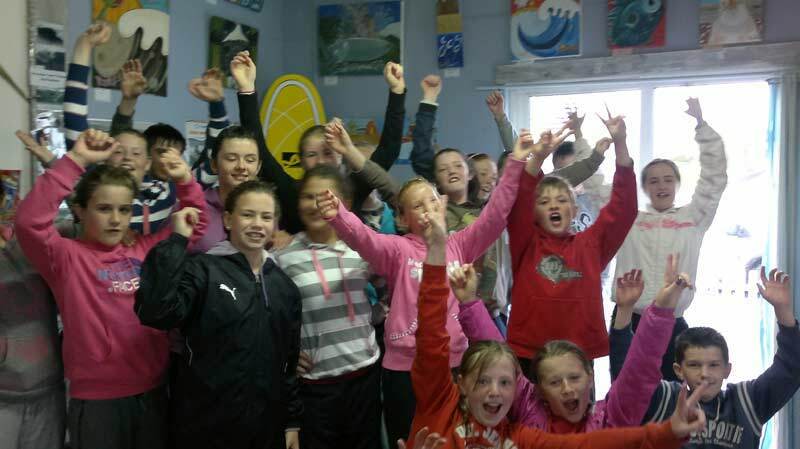 LEARNING Irish is fun at Freedom Surf School . 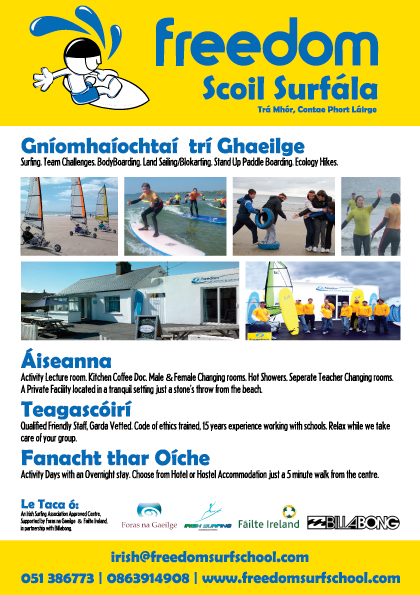 Accredited by the Irish Surfing Association and supported by Foras na Gaeilge. The Surf lesson starts with a 15 minute land based instruction & safety brief at the surf school base, followed by wet suit fitting & changing. 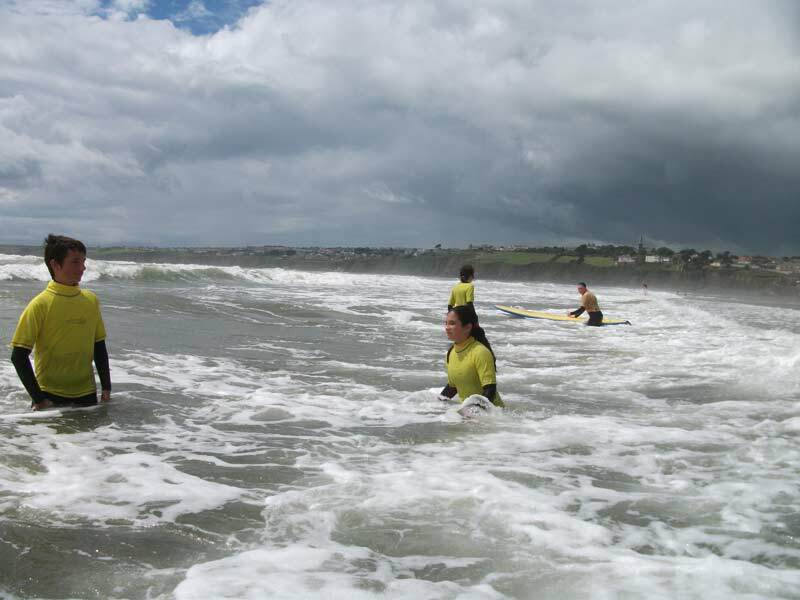 A light warm up at water’s edge, then into the surf with your instructor for approximately one hour. Instruction takes place in waist depth water for maximum learning, enjoyment and safety. 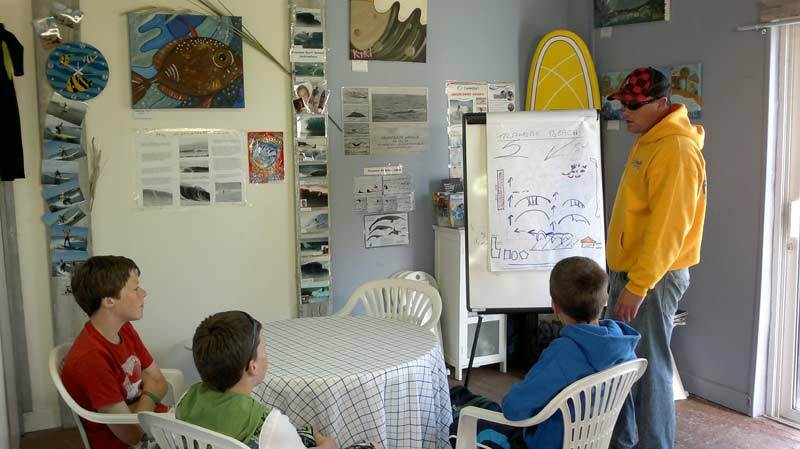 Return to the surf school for a hot shower, relax and lesson recap in the kitchen Coffee Doc. 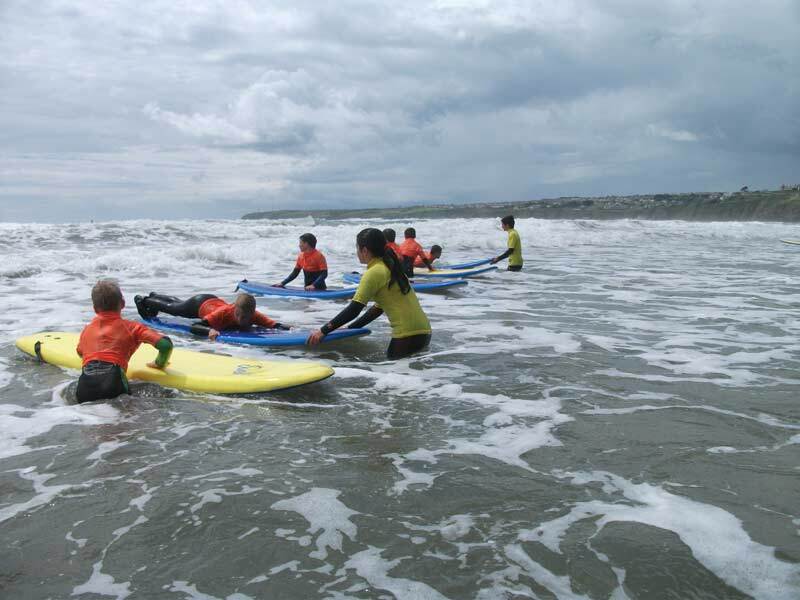 Please note : lesson / surf camp times may be changed to suit surf / weather conditions. Wetsuit, boots, (hoods and gloves in winter), beginner Surf Board. 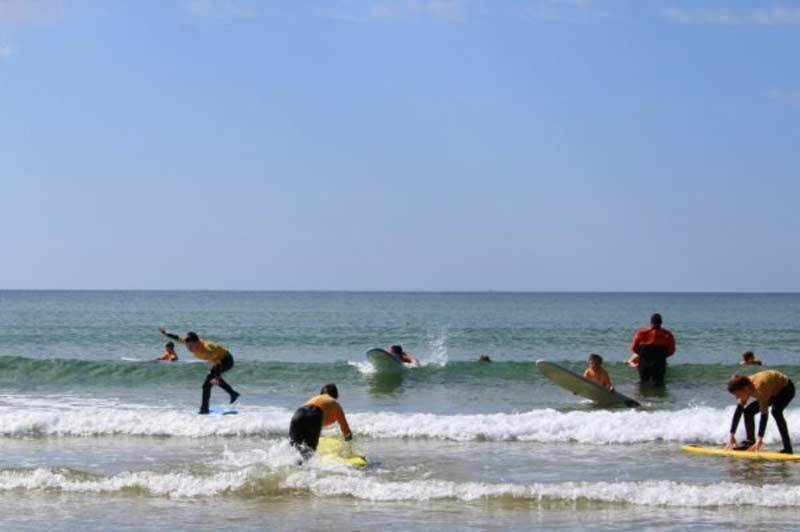 We have a wide range of wetsuits and equipment, our experienced Surf Instructors will provide the necessary guidance to make sure the equipment is right for you. 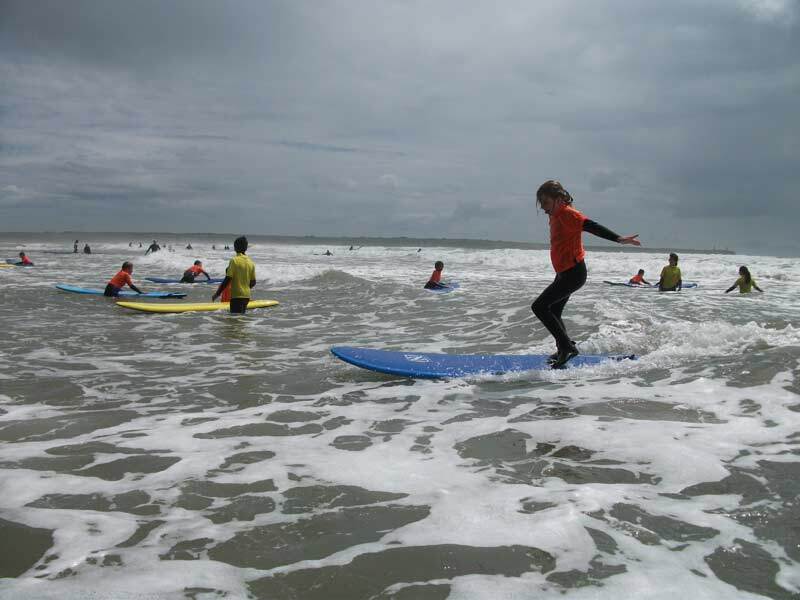 We start with the fundamentals of surfing which provide you with the best foundation to build your surfing skills. 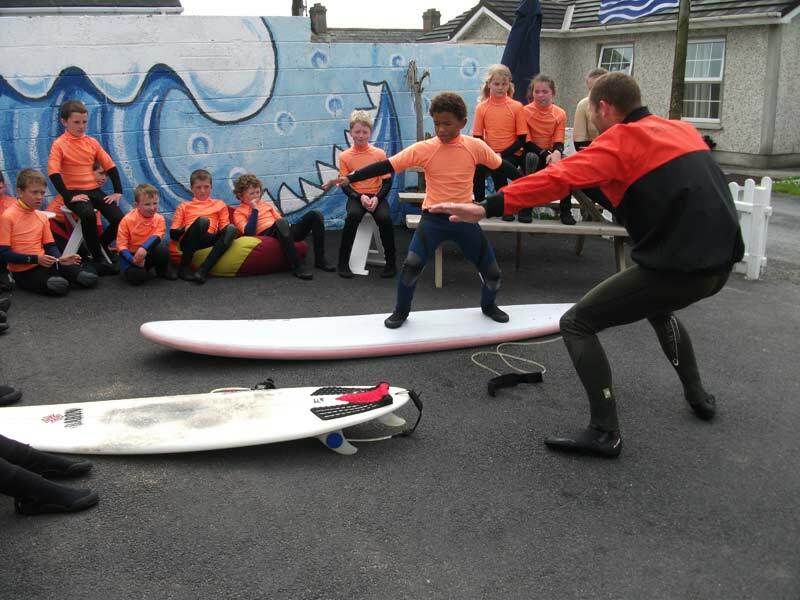 Our experienced surf instructors will take you through step by step techniques on how to get to your feet. This is all done in a fun and relaxed atmosphere geared to building your confidence and encouraging you as you progress. 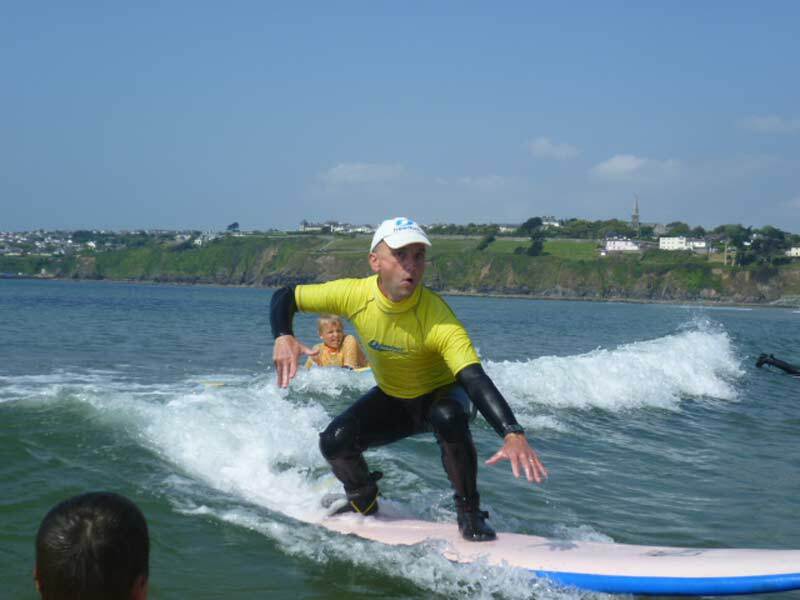 Our Developer Surf Lesson progresses the surfer to start riding unbroken waves. 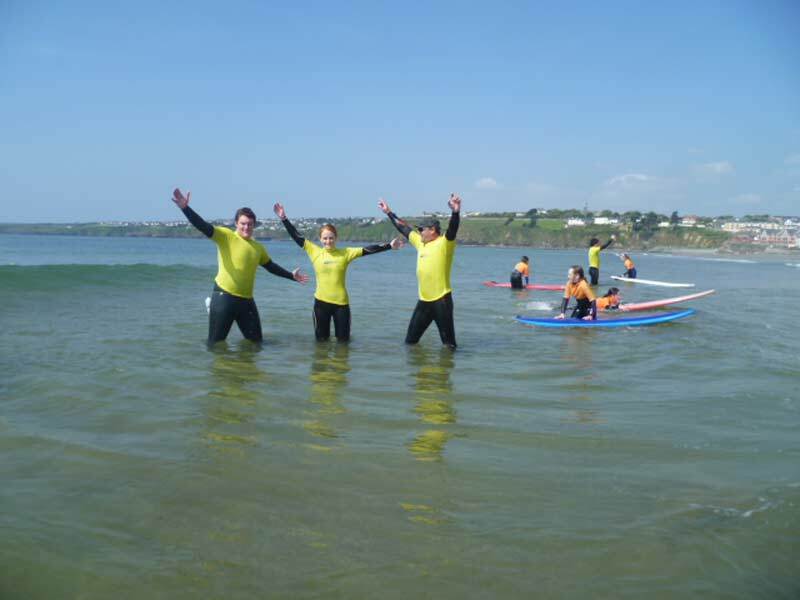 Your instructor will help you to develop paddling out skills, duck diving, understand positioning, wave selection, top/bottom turns and cut back along with gaining an understanding of body movement. 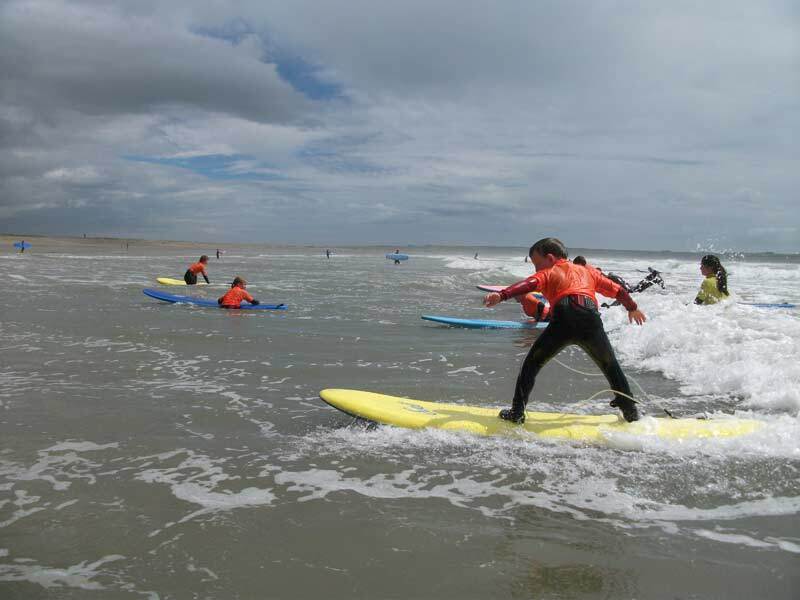 After completing these lessons you will be on your way to a new level of surfing. 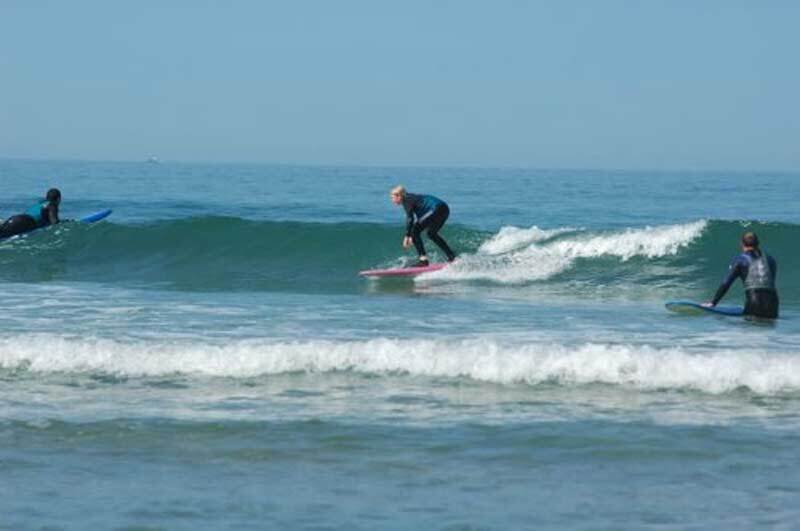 Our Improver Lesson builds on the basic surfing techniques you have learned, improves your paddling skills, speed up your pop up and develops your turning. 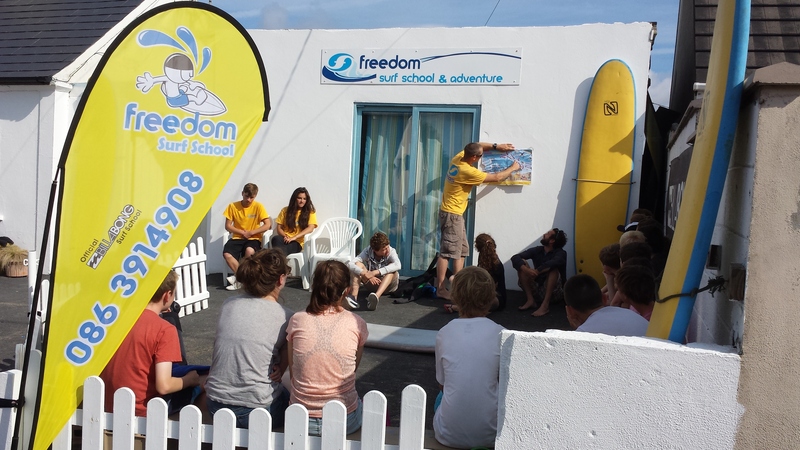 During the session you will be given specific tasks and goals to focus and work on to improve your surfing skills. 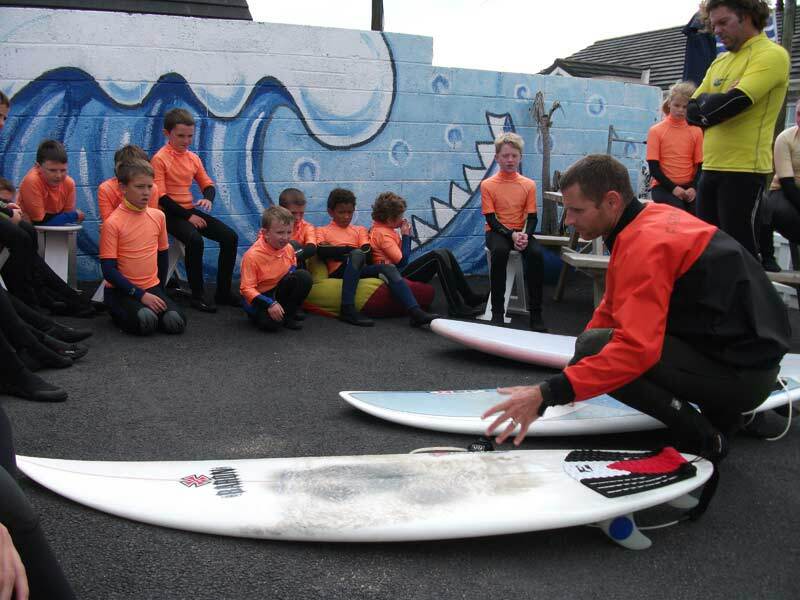 All our Instructors are experienced surfers and Irish Surfing Association Qualified. The ISA ratio of one instructor per eight surfers. 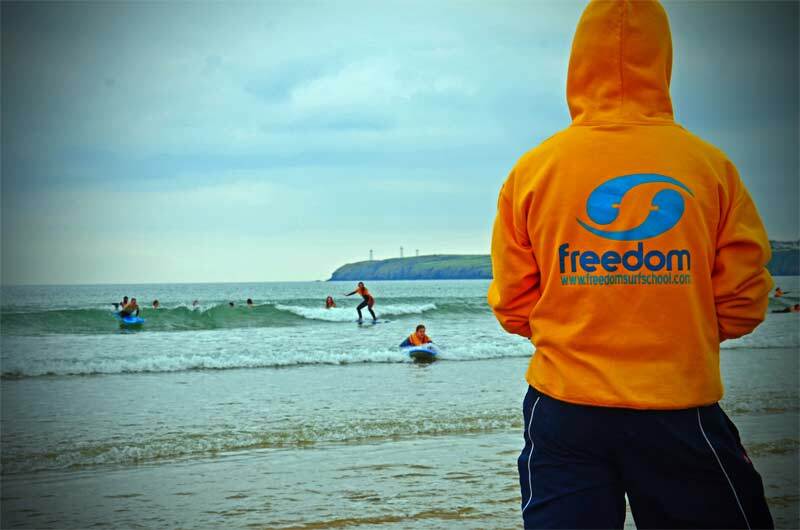 All Instructors are qualified lifeguards and first aiders. 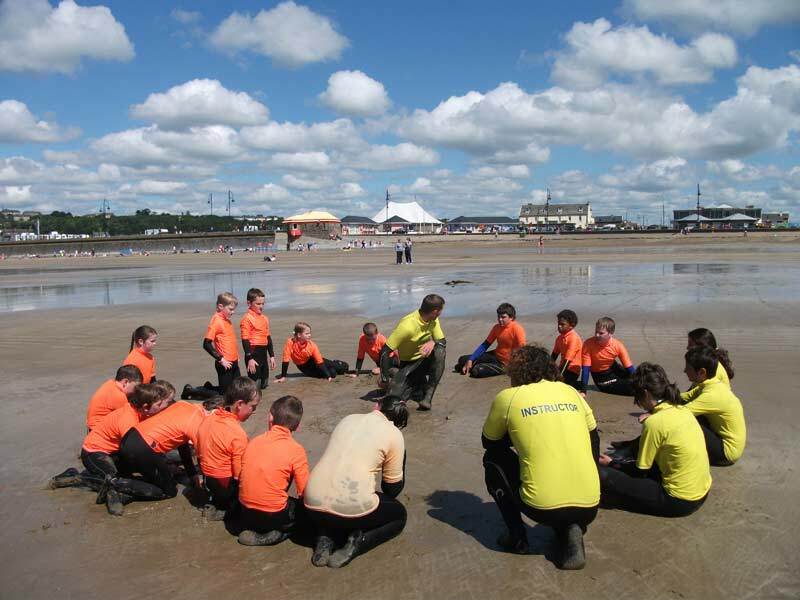 For added safety we use Coloured Vests over wetsuits for high visibility and identification. 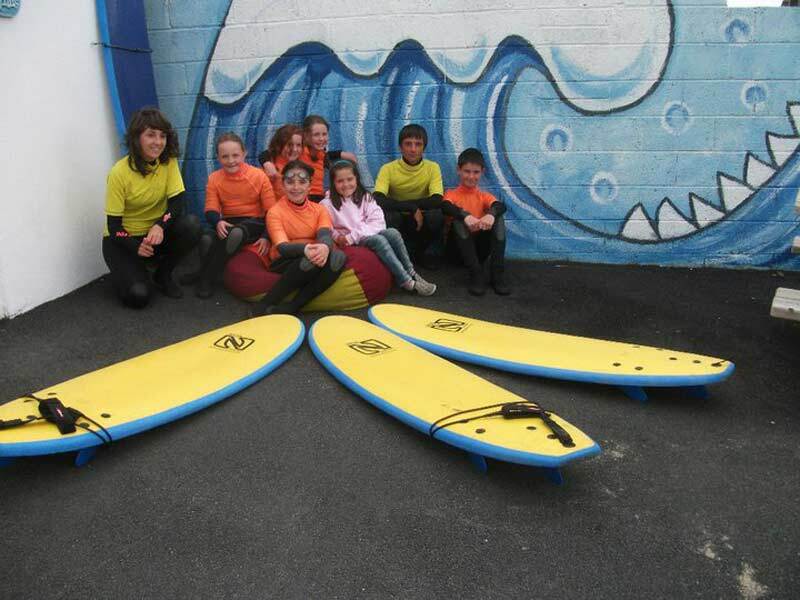 We are an Irish Surfing Association Approved Surf School. 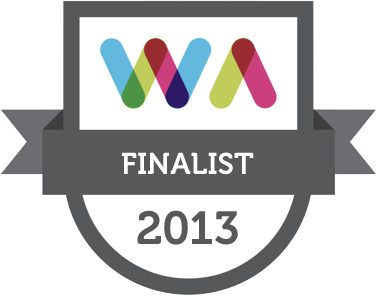 Freedom has opened the door to a whole new world for my daughter – She had a fantastic time, see you soon.